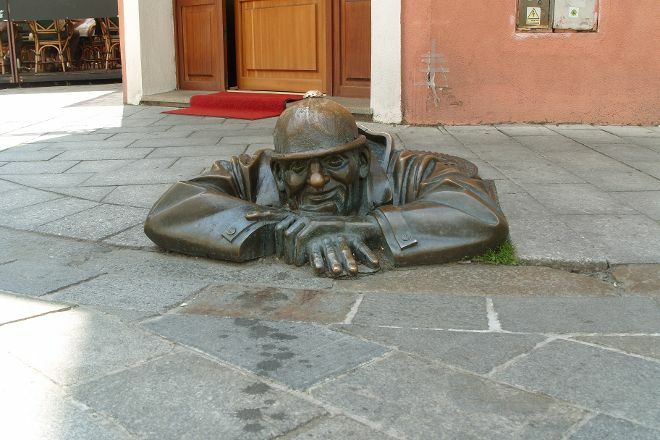 Cumil is a bizarre bronze sculpture of a peeping Tom emerging from a manhole. Probably the city's most photographed tourist attraction, it has raised many heated debates over the question of the depicted man's business. It is unclear whether he's resting after cleaning the sewer or peeking up women's skirts. The statue is marked with a road sign since reckless drivers have chopped its head off at least twice. Follow local custom and rub the top of his hat for good luck. Keep in mind that this is just one of many curious characters placed throughout the city. 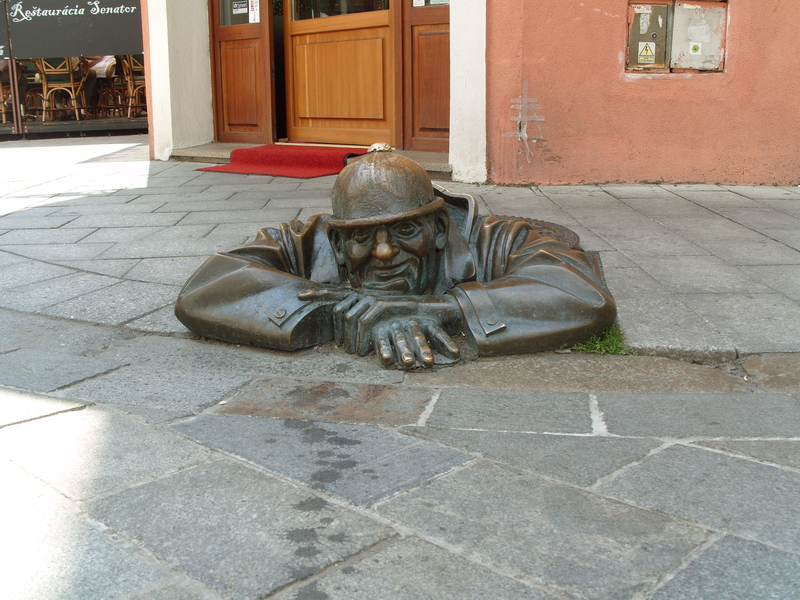 Plan a trip to Bratislava easily and quickly by telling Inspirock to suggest an itinerary. Nothing to write home about ... ... Yes is in the center of town and you will see why many tourists stop for some depiction. This image was installed in 1997. About Cumil there are many stories but none of this, however, turns out to be wrong. It's just a random image on the corner of the street. Cumil is over the years several times damaged by inattentive car drivers but the image is not only a danger to car drivers, but also for pedestrians in the dark every now and then about him stumble. To these drivers, persons and especially to protect itself Cumil, installed the city just above his head a warning sign. Take your time for a photo because there is always a big row. Every day, we help thousands of travelers plan great vacations. Here are some tips on how to use your Listing Page to attract more travelers to your business - Cumil. Promote your permanent link - https://www.inspirock.com/slovakia/bratislava/cumil-a611035543 - on your website, your blog, and social media. When a traveler builds a plan from this page, the itinerary automatically includes Cumil. This is a great way for travelers looking for a great vacation in your city or country to also experience Cumil. Promoting your link also lets your audience know that you are featured on a rapidly growing travel site. In addition, the more this page is used, the more we will promote Cumil to other Inspirock users. For best results, use the customized Trip Planning Widget for Cumil on your website. It has all the advantages mentioned above, plus users to your site can conveniently access it directly on your site. Visitors to your site will appreciate you offering them help with planning their vacation. Setting this up takes just a few minutes - Click here for instructions.